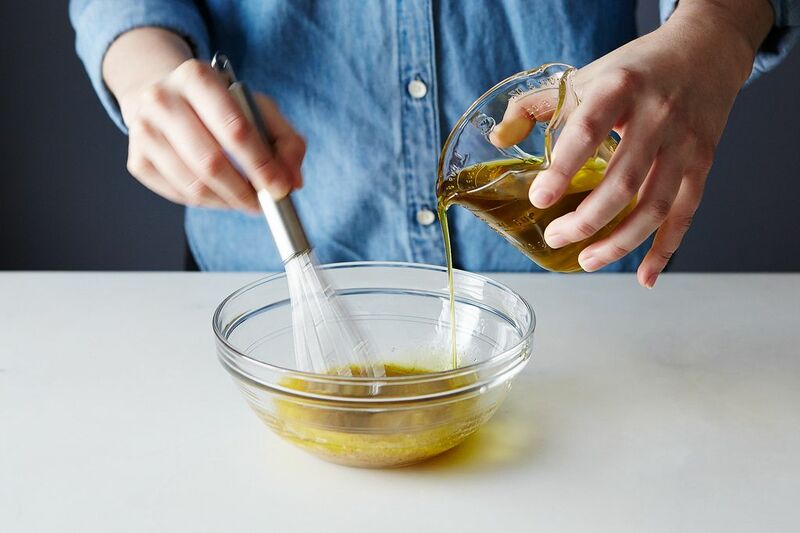 Today: Food52's Associate Editor Kenzi Wilbur holds vinaigrettes near and dear to her heart. This is how she makes them -- for vegetables, for salads, for finger-dipping -- without a recipe. 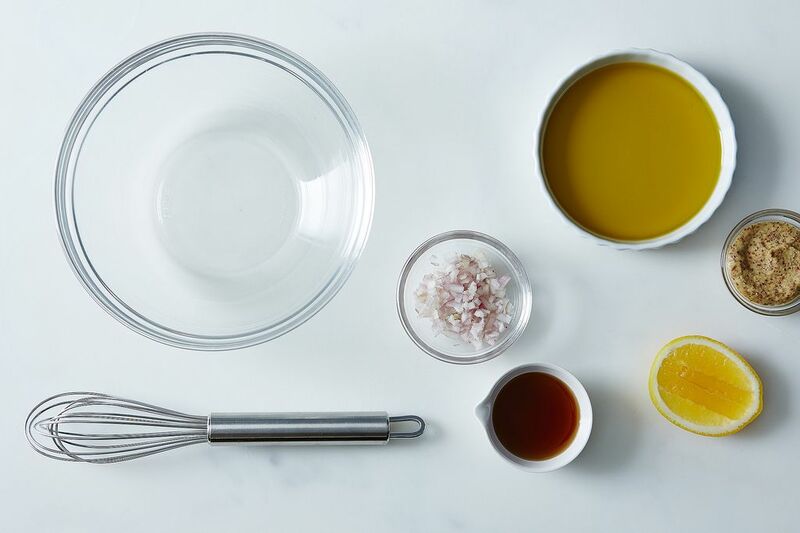 When we cook, we need vinaigrettes like we need salt. They’re not just endlessly applicable (they are), or endlessly adaptable (they’re this, too) -- they’re essential. They coat our grains, ride on the backs of our lettuce leaves -- they are the arm around the shoulder of an otherwise sad carrot. Without vinaigrette, we’d be wading in a world of plain greens and unadorned leeks and stark naked potatoes. In other words: We’d be nowhere. Secure a whisk, ready a bowl. 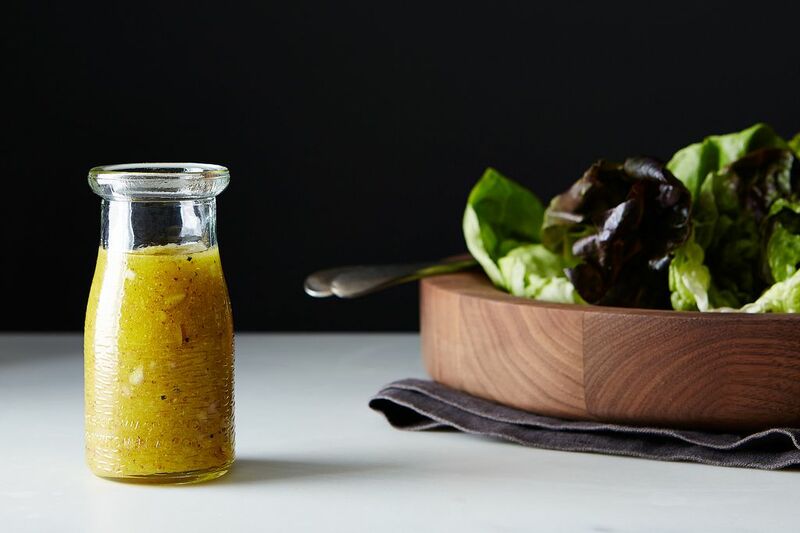 This is how you make a vinaigrette without a recipe. 1. In a bowl, combine everything that will be in your vinaigrette, save for the oil. You’ll need acid: I like lemon, or sherry vinegar. 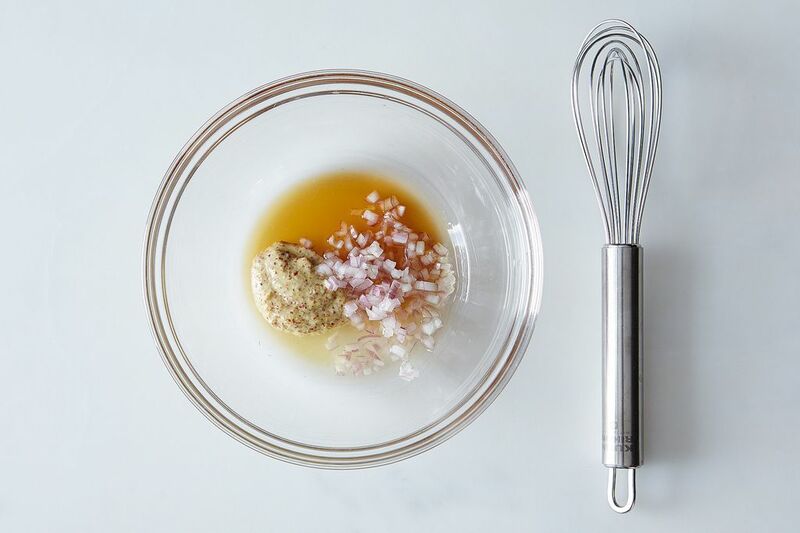 You’ll need help emulsifying: Reach for mustard, Dijon or otherwise. And then you get to play: I add a slip of maple syrup and about a tablespoon of chopped shallot, but feel free to go wild; the vinaigrette is your canvas. Now is the time to add spices (Cumin? Piment d’espelette? Curry? ), salt and pepper, and all manner of fresh citrus juices or herbs. A note about ratios: I like my vinaigrettes to be close to 1 part vinegar to 3 parts oil -- this is somewhat standard. If you like a tart dressing, go closer to 1 to 2. The rest should be to taste, but for around a cup of dressing, I usually add a heaping teaspoon of mustard and the same of maple syrup or honey, and scant pinches of whatever spices I’m using. 2. Whisk in your oil. Slowly. Can you successfully dress your food without emulsifying? Yes, you can. But if you take the time to emulsify, your dressing will have new life. It will be thick, velvety; it will coat your salads with vigor instead of falling, weak and lifeless, to the bottom of the bowl. If you're doing this in a jar, just shake like the dickens. Now go forth and dress everything in sight. Store the leftovers in the fridge, and do the same tomorrow. Kenzie Wilbur, please tell me, what is piment d’espelette? Thanks for that link. It's made me curious enough that I'm going to look for seeds to plant. I love having various levels of heat in the kitchen. If you want a real no recipe salad dressing read Marcella Hazan's Essentials of Italian Classic Cooking on how to dress a salad. No recipe. No whisking. No extra bowl or jar. No leftovers to store. Just a well dressed salad every time. I use this method frequently and have received many compliments especially when I make it with lemon juice which adds a very fresh taste. I've never used xanthin gum before - can you tell me about how much you'd use for making a cup of dressing? I have been making salads for a couple of decades and have never used a recipe, ever.Always start with oil , and have used vinegar,apple vinegar,lemon, orange,balsamic etc, Then i add dijon, or mayo , or both,or horseradish mayo for bite,cilantro sauce i take from pollo tropical,minced garlic, tomato water from the chopped tomatoes and 1/2 the amount of oil, this is really fab, salt, sea salt, truffle salt,pepper,honey, japanese rice vinegar,chopped basil, thai basil.Any combo starting wiih the oil and an acid.Manyy times tomatoes are tasteless, instead 1/4 them and brush with oil ,salt and a drop or two of honey and roast at 375 for 2o minutes .I love adding dries cranberrys, cut orange,blue cheese(or wisked in the dressing, chopped walnuts,peanuts,chopped chicken and pork from last nights dinner etc.Almost anything can go in a salad, BUT STRAWBERRY OR MUSHY FRUIT,ALFALFA SPROUTS (AN INSULT TO FOOD). If putting in avocado toss over the top rather than get it all mushhy , th esame for hard bolied eggs.BTW, a yolk in the dressing really adds some luxury(NOT WITH BLUE CHEESE , TOO RICH THEN).aLWAYS A NEW WORLD OF SALAD OUT THERE , ENJOY! My grandmother raised me on a vinaigrette that was her own recipe. Although I know what went it, I have been trying to reproduce it for the last 45 years! I have come close but it just misses her touch. I don't care for the taste of Dijon mustard in my Viniaigrette. Maybe it is an acquired taste. What is the best mustard to use? I do want to make a tasty vinaigrette. I realize your post was made almost 2 years ago, but since nobody else answered, and I feel strongly about it, I'll answer: my favourite by a long shot is Maille. It's from France, and cost me about $4.75 for 500ml (I think that's about 5 oz?) For me, that's a splurge. I believe many Italian cooks add a few tablespoons of water to their vinaigrette. I do and like the milder flavour of the dressing. Also, I don`t think true Greek salads have vinegar as an ingredient. They often let capers and tomatoes sit together for a time, before adding the rest. The tomatoes and capers provide all the acidic flavour required! how long does homemade vinaigrette last in the fridge? I add a tad of pomegranite molasses to the above "non-recipe". Amazing what White Balsamic vinegar can do to a vinaigrette! I can't make a vinaigrette without minced garlic. And finely chopped fresh basil is nice too. For a sweet touch, add mango nectar to oil and wine vinegar. Here's one that had everyone asking for the recipe: a whole mashed avocado instead of oil, freshly squeezed orange juice, minced garlic, and salt and pepper; salad garnished with toasted pumpkin seeds. I too like my vinaigrette a bit tart, so I'm more of a 2-1 girl. I love to vary my vinegars since making a vinaigrette is a moody thing with me. And, I like a bit of fresh squeezed lemon juice in it as well. I use either some minced garlic, or shallot, and a dab of Dijon as well. Herbs and spices go with the mood I guess, or what I'm serving it with. I too am a "jar shaker" as it does emulsify great that way, and there's no wisk or bowl to clean up. Then the left overs go in the fridge in the same jar. I think once you get the hang of it, you'll never, ever go back to store bought with all the crap they put in it. I couldn't agree with you more; I can never believe anyone uses bottled dressing when it's so easy to make your own fresh vinaigrette. I guess I'm one of the few people around who don't use mustard in my vinaigrette. I add the acid to the bowl and crunch in a few pieces of Maldon Salt. After this sits for a few minutes, I whisk like crazy and then dump in my very, very, very dry, cold greens. If I need help emulsifying, I either add a tiny bit of heavy cream, or very unorthodox but truly successful store-bought mayonnaise. It works like a charm. Try it. I like to finely dice Pepperdew peppers for the dressing and add a little of the sweet liquid that comes with the peppers. I also like to dress the salad and take honey and trace a spider web of honey just before serving. It provides a bit of a surprise when you get caught in the web. It adds a certain degree of "au pif." I'm with you on the "no recipe" thing, but then I always feel like a bit of a flake when a friend asks me for the recipe to a certain dish or dressing and I end up saying something vague like "you just have to FEEL OUT the white pepper..." or "you'll just know when it's right!"